Looking for authentic U.S. Military Specification Standards (MIL-STD) for gun parts, safety products, or other hardware? Log on to EverySpec.com. This website provides FREE access to the complete archive of U.S. Government spec sheets and technical manuals. You can quickly access and download thousands of public domain U.S. Government documents. For example, we searched for “Picatinny” and came up with MIL-STD-1913 “Dimensioning of Accessory Mounting Rail for Small Arms Weapons”. With one click we downloaded the file as a PDF. 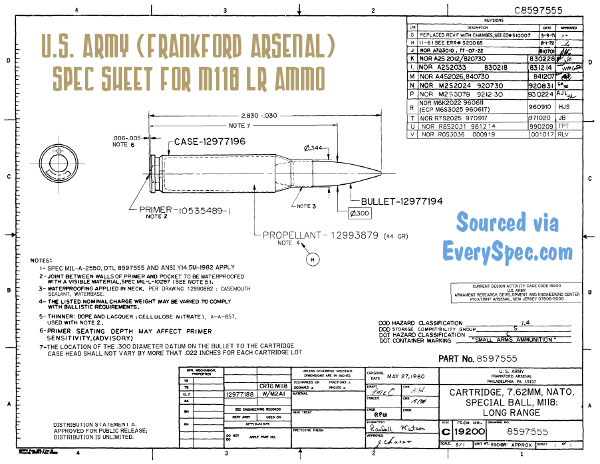 Then a search for “M118″ yielded the engineering drawing for 7.62×51 M118 LR Match ammo. Pretty cool. Using EverySpec.com is fast and easy. And everything you find and save is FREE. Search as often as you like — there are no limits on search requests or downloads. You can either search by keyword, or Federal Supply Class Code (FSC). CLICK HERE for a complete list of FSCs for all products. Here are FSCs for a few common product types. Keep in mind that there are hundreds of other FSCs — for everything from Office Supplies (FSC 7510) to Nuclear Projectiles (FSC 1110). Credit Gunsmith Thomas ‘Speedy’ Gonzales for finding this resource. Thanks Speedy! Share the post "Find and Download MIL-STD Spec Sheets for FREE"